The chief purpose of "On A SEARIUS Note" is to motivate and inspire. It is not designed to be a "preachy" text or a sterile and detached explanation of social science results. A simple truth of life is that many of us know what is "right." This book combines introspection, poetry and transparency in a way that presents many of these same truths in an easy-to-comprehend and freshly invigorating manner. American culture values entertainment. It values comics that make us laugh at truths we would scoff at if the evening news reported similar. Citizens are stuck in the crosshair of desiring more and the reality that comes with their present situations. This book offers a timely release of the tension that comes with everyday living. "On A SEARIUS Note" provides motivation that is designed to be used. It provides elaboration that is necessary (because there is only so much that you can include in 140-160 characters). It provides insight into the perspective of an ordinary individual with extraordinary vision (in light of less-than-desirable circumstances). 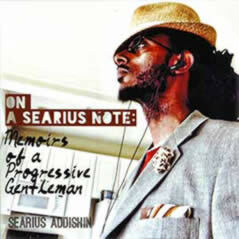 More than the insight expressed through the notes, "On A SEARIUS Note" personifies the intersection of emotion and logic. Popular culture is saturated with witty memes, inspirational pictures, and "catch phrases." "On A SEARIUS Note" goes beyond the "notes" by showing how the lessons can be applied - and what happens when you do not apply them. All of the above is expressed with a friendly, humorous yet thought-provoking undertone. Note: Randomly throughout the book you will find blank pages. These pages are for you to jot any notes or thoughts that may come to you as a result of reading the text. Feel free to write your thoughts/sentiments/ideas down!